This tubing is able to withstand extreme temperatures and contains no acid or sulphur producing chemicals so it is safe to use against other materials. This tubing is also resistant to ozone and UV. Short term steam use is ok. I have been doing a lot of tinkering lately (yup, that's why!). I cannot get the mechanical aspect of CNCs out of my system, so until then, enjoy the crazy concoctions. 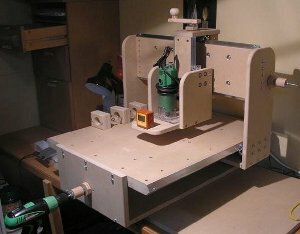 Here is a scratch built machine (from the plans or book) that exhibits great workmanship, but more importantly, how some of the construction of the CNC machine was done. William L. used sound techniques to make sure the machine would be constructed as intended, knowing that some of the machine would have various size differences within the sub assemblies that would make some of the measurements within the plans not work.